Celebrations in life, and particularly in sport, are often multifaceted. Here are a few of Chris's favourites. Enjoy! Seoul Olympics 1988. Exhausted winner of 20km walk, Jozef Pribilinec, Czechoslovakia, gets a congratulatory kiss from East German second placer, Ronald Weigel. Maurizio Damilano, Italy, looks on. London 2012. David Rudisha, Kenya sets a new WR in the men's 800m. Many considered this the best athletics performance at the Games. 1988. Chris Maddocks shows a skillfully penned scroll given to him by flatmate, Andi Drake, after returning from an Olympic qualifying performance in Hungary. It reads: 'Chris "Mad Max" Maddocks, Sly Fox of the Year Award. Congratulations on your race of 83.45'. 1984. Britain's Charlie Spedding wins the London Marathon. He would go on to acheive a bronze medal at the LA Olympics. Sydney 2000. The great Haile Gebrselasse, Ethiopia, outsprints Kenya's Paul Tergat in a pulsating 10000m. London 2012. Jessica Ennis accepts a congratulatory kiss from her British teammates after winning Heptathlon Gold. Burrator Reservoir, England, 1992. Chris Maddocks receives a winner's hug from Mum after his 82.12 20km Olympic qualifying walk. Japan, 1996, Britain's Damon Hill wins Grand Prix's F1 title. Murray Walker, BBC sports commentator, spoke for many when, emotionally effected, he famously said at the time of Hill passing the chequered flag, "...And I've got to stop, because I've got a lump in my throat". 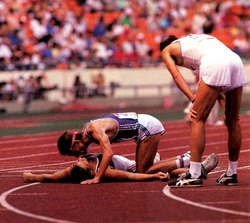 Seoul 1988. Flo-Jo, USA , wins Olympic 200m in WR 21.34. Sydney 2000. Cuban, Felix Savin wins his third Heavyweight gold medal. Kuala Lumpur 1998 Commonwealth Games. A shock 50km walk gold medal for Malaysia's Govindasamy Saravanan, as he overhauls longtime leaders Craig Barrett and Tim Berrett from New Zealand and Canada respectively. London 2012. Crowds were captivated by the mesmerising performance of Olympic individual dressage gold medal winner, Britain's Charlotte Dujardin riding Velegro. 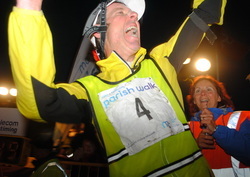 Chris Maddocks, 21 years old, moments after he had won an undulating Plymouth - Dawlish 42mile road walk in 6hrs 26mins 8secs. 1984. The rivalry between Britain's two best female javelin exponents was at least amicable and respectful in the early years. Tessa Sanderson would go on to win Olympic Gold, and Fatima Whitbread would become World Champion and WR holder. 2013 London. Britain's Andy Murray shares his joy at becoming Wimbledon tennis champion. 1984 Trentham Gardens. The beauty of winning. 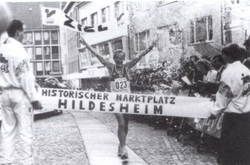 Britain's Christine Barrett runs a 6 day WR 421 miles. 1984. Men's 6 day winner, Mike Newton, covers 516 miles, and shares a celebratory hug with women's victor, Christine Barrett. For Newton, it was the third time he had run beyond 500 miles in 6 day competitions. 1985. Chris Maddocks recovers In the santuary of a race supporters tent. His friend, Edmund Shillabeer is happy to have won the British National 100km (250 laps) with a track record of 9hrs 41mins. Comrades in arms. Aleksandr Potashov and Andrey Perlov USSR, try to contrive a joint 50km walk win at 1991 World Athletics Championships, Tokyo. Potashov was adjudged to have won by 0.01sec. Commonwealth Games 1998. It's all smiles for Australia as Jane Saville and Kerry Saxby take gold in Kuala Lumpur with England's Lisa Kehler happy to collect bronze. 2013. Gary Morgan USA celebrates the completion of yet another marathon. He raced the 20km walk at the 1988 Olympics. Today he is also writer and administrator in US Track & Field. Dehli, India 2010. Johanna Jackson is jubilant as she carriers the flag of St George across the 20km race walk finish line. Commonwealth gold is the English women's first taste of major championship success. Sydney 2000. Heike Drechaler, moments after winning the long jump, a title she previously had won in 1992. In total, the German achieved 5 Olympic medals. Sydney 2000. Jonathan Edwards celebrates a gold medal winning leap in the triple jump. Jumping for joy! Kevin Young runs an astonishing 46.78 400m hurdles WR at the Barcelona Olympics. 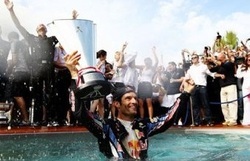 Mark Webber celebrated his F1 Grand Prix win at Monaco in style. The Australian somersaulted into his Red Bull team's pool, and then beckoned others to join in the fun. Tokyo 1991. 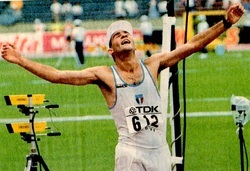 Maurizio Damilano wins World Championship gold. Lying a distant second on his re-entry to the athletics stadium, the Italian benefitted from USSR's Mikhail Shechennikov's misjudgement near the finish of the 20km walk. Thinking he had crossed the winning post the Soviet walker slowed to a virtual stop thus allowing his pursuer to storm past and claim an unexpected victory. Moscow 1980. 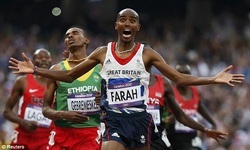 This image is one that is immortalised in Olympic folklore. After the personal disappointment of 'only' claiming silver in his favoured 800m event, Britain's Sebastian Coe makes some amends by winning the 1500m, ahead of East German, Jurgen Straub and teammate, Steve Ovett - winner of that 800m a few days earlier. The agony and the ecstasy. Sydney 2000. In front of 100,000 spectators, Robert Korzeniowski sinks to his knees moments after winning the 50km race walk, thus adding to the 20km title he'd won days earlier. The Pole is arguably the greatest walker in history; gold medals from four Olympic races, 3 World Athletics Championships, and 2 Europeans, would go some way to verifying that opinion. Beyond retirement in 2004, he has worked as an administrator with the IOC, been a Polish sports ambassador, and had various roles within the media. Barcelona 1992. Kevin Young,USA , appears bewildered by the magnitude of his superb 400mH WR. Pavol Blazek sets a fabulous new 20km road best of 1.18.13. The Czechoslovakian's time would stand for four years. Isle of Man 2013. Michael George amid joyous scenes following his 85 mile Parish walk win in 14hrs 44mins 49 seconds. Los Angeles 1984. Satisfaction personified. Sebastian Coe becomes the first man to retain the Olympic 1500m title. On the podium with him are, compatriot, Steve Cram, and Spain's Jose Manuel Abascal. Kuala Lumpur, 1998 Commonwealth Games. It's not always about winning: Coached by teammate, Chris Maddocks, Steve Hollier finishes 4th in the 50km race walk and demonstrates the sheer pleasure of performing beyond expectations on the big occasion. Whilst others wilted in the extreme Malaysian humidity, the Englishman gradually picked off the leading casualties and claimed a position just outside the medals. Atlanta 1996. Legendary USA sprinter, Michael Johnson moments after his 200m Olympic gold medal win in 19.32 WR. London 2012. Britain's Mo Farah enjoyed a couldron of patriotic noise as he claimed his second gold medal of the Games with this 5000m run. London 2012. Tianna Madison, Bianca Knight, Carmelita Jeter, and Allyson Felix share the joy of winning the women's 4 x 100m gold medal. Their 40.82 clocking shattered East Germany's long standing WR time of 41.37 which had stood since 1985. Jeter's wide-eyed reaction on seeing the timing clock as she raced through the finish line was one of the highlights of the Games. French race walker, Johann Diniz is fast over both Olympic 20km and 50km distances. He has won multiple major championship medals, including world and european. IIn March 2011, and in front of 4000 partisan supporters, he set a new 50km track record of 3hrs 35mins 27secs. Over the tannoy system, he stayed 'pumped up' throughout much of the final 25 laps by listening to a playlist of his favourite music, including, The Rolling Stones, Iggy Pop, and French rock band, Noir Desir. Premature celebration at Sydney 2000. Lofted high by a Romanian team coach, Andrea Raducan is soon stripped of her Olympic Champion status for a drugs violation, and sees her gold medal awarded instead to teammate, Simoan Amanar. 2012. 'Proud to be British'. 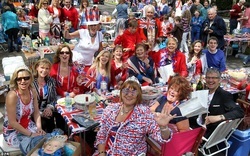 On the occasion of the Queen's diamond Jubilee, street parties were evident up and down the UK, thus marking in fun fashion, the monarch's 60 years on the throne. London's Wembley Stadium, April 1992. A remarkable tribute concert to Queen's late charasmatic lead singer, Freddie Mercury. Fans enjoyed performances from the likes of David Bowie, Guns 'n' Roses, George Michael, Elton John, and U2. 1996. TV Gold. After 16 years of poverty, the Trotter family fortunes suddenly change. 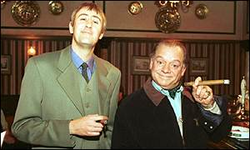 The scene where Del boy and Rodney are sat in their yellow Robin Reliant car from an Only Fools and Horses episode entitled, "Time on our hands" is priceless comedy. The auction sale at Sotheby's of an old stopwatch found in their lockup garage results in them becoming £6.2m richer! The brothers' joint celebration is hilarious. Watch it on You Tube and see for yourself. September 2014: Tower of London. Chris Maddocks' photograph of poppies commemorating soldiers killed during the 1st World War.